Are you handy around the house? DIY projects around the home can be very satisfying and can also save you a bundle of money. Whether you are making small, simple repairs or building something from scratch, the amount of advice available can be overwhelming. When it comes to finishing and paint, the choices are a bit more selective but the type of paint you choose is just as important as the colour. Here is a look at the pros and cons of oil based paint. Oil-based paint is made with either natural oil, such as linseed or synthetic or alkyd oil. Latex paint are water-based. When using oil paint, the texture is smooth, the application is easy and thick with a high gloss finish. It usually takes less paint to complete the job. Clean up may not be as smooth as it will require mineral spirits such as turpentine and will need to be disposed of following hazardous regulations. Latex paint can be cleaned up with soap and water, dries much faster but may require more coats to cover darker surfaces or stains. Oil paint is nice to work with. Smooth and thick, it coats the surface well and soaks into and adheres to the material. The job can often be competed with one coat, plus, the longer drying time gives you more time to work with it. It’s slow dry time also means less shrinking and the strength of the paint means more durability, in particular in high-traffic areas. When dry, it’s high gloss finish is not only pleasant to look at but can also mean less chipping and any marks or smears can be easily washed off. 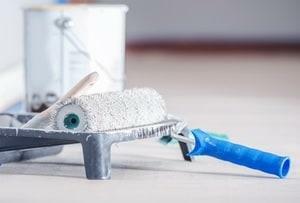 If a tight budget is foremost on your list, the oil-based paint is definitely more expensive. Not just the paint, but also the accessories. You’ll need high quality brushes or rollers, mineral spirits to clean the area and the brushes, and of course disposal will require effort. The fumes of the paint and the turpentine can be rather strong and may cause a negative reaction to the user. The longer drying time may also not be advantageous for you, and the long term result may fade or crack. Latex paint is the far more popular choice for the everyday DIYer. The less expensive price tag, the easy clean-up and the quick drying time make it much more appealing. The quick drying time means you can easily finish two coats in one day and the soap and water clean up is safe, fast and easy. It’s very easy to apply and any required touch ups. It comes in gloss and matte, can be used on most surfaces and is quite durable. It also may be more widely available. Also, no strong odour, which may be important in a small confined, unventilated space. Latex paint does not clean as well as oil paint. In fact, you may need to wait up to four weeks before you can wash away any smudges. Latex paint also usually requires a base coat and may not be practical for certain surfaces, like wood, concrete and metal. You shouldn’t use it over gloss paint as it will peel and it’s just not as durable as the sturdier oil paint. The latex paint may fade or yellow after a while as well. Paint are not created equally. If you are a novice like me, you will need to do a bit of research. Ask a neighbour or friend, ask where you buy the paint. You can also just check online for helpful tips. It’s always best to tackle the job informed, even the smallest job. You really don’t want to do the same job more than once. Picking the right paint for your project is just as important as the project itself. Buying the cheaper paint may not always be the bargain in the long run. Not only that, you have to invest in the tools that will allow you to work well with the paint. Using cheap tools may cost you more because you will not be able to apply the paint properly due to the incompatibility of the tools. Another concern is the deterioration of low quality tools when used with strong, reactive paint materials like oil-based paint. This is why you need to look closely at the pros and cons of oil based paint. It may be more expensive, but it gets the job done and is a good investment in the long run. You just need to make sure that you are prepared to spend more than your budget.